Bakiika hands Kasule his nomination form last week. Courtesy. The FUFA Electoral Committee has locked the door to the forthcoming presidential election in Mujib Kasule’s face. 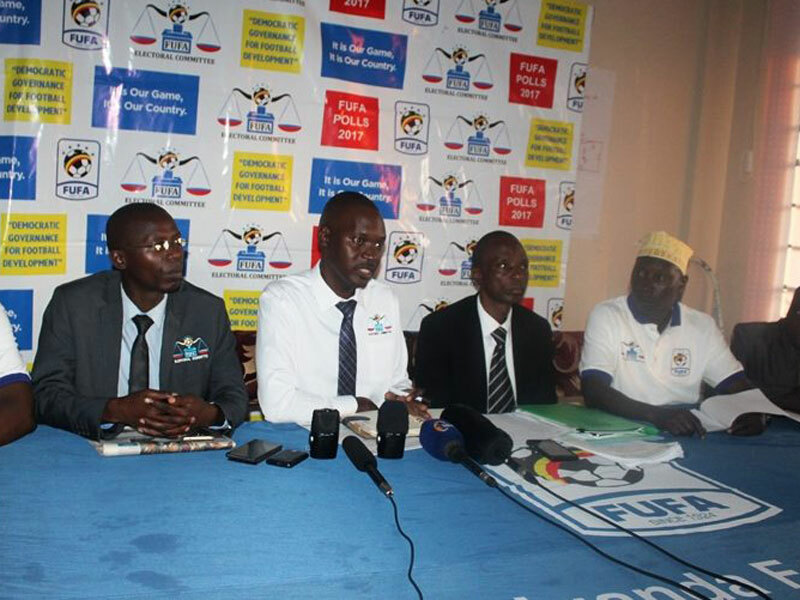 During a brief media conference the FUFA Electoral Committee chairman Samuel Bakiika, flanked by his deputy Yusuf Awuye and committee members Habib Aluma, Geofrey Kintu, Michael Igole and Stanley Kinene, said they had arrived at the decision after scrutinising the nomination documents submitted by the aspirant. 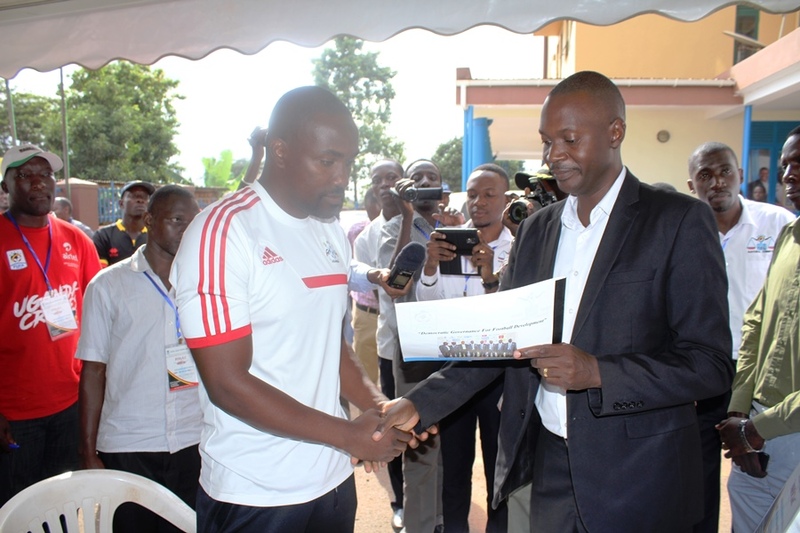 Mujib Kasule, a former Fufa vice-president and current Proline director and coach, picked nomination forms after returning the Shs3 million paid bank slips to the office of the Electoral Commission on Tuesday last week. He was booked for return of the nomination forms at 2.30pm on Friday, but drama ensued later when his entourage was allegedly blocked from reaching Mengo. In a statement, the electoral committee said whereas the said Kasule was required to return the nomination documents to the Committee at 2:30pm on Friday, he only appeared before the committee at about 4.30pm shortly before the close of business. “Nonetheless, the committee was compelled to adjourn and reconvene on the next working day, being Monday (today). The committee said that on Monday, it further scrutinised the nomination documents submitted by Mujib and found that he did not comply with the mandatory requirements. The decision means only incumbent Moses Magogo has duly complied with the rules and will likely be declared unopposed if Kasule does not successfully challenge the directive. Friday 16th June 2017 was the final day for returning nomination documents in accordance with the FUFA Statutes, FUFA Electoral Code 2012, and FUFA Electoral Guidelines, on that day the FUFA Electoral Committee (herein referred to as the Committee) received Nomination forms from a one Kasule Mujib an aspiring candidate for FUFA President and FUFA Executive Committee. The Committee would like to point out that whereas the said aspiring candidate was required to return the nomination documents to the Committee at 2:30pm on Friday 16th June 2017, to enable the Committee ample time to scrutinize the returned documents, the said aspiring candidate only appeared before the Committee at about 4.30pm shortly before the close of business. Nonetheless the Committee was compelled to adjourn and reconvene on the next working day, being Monday 19th June 2017. On this Monday 19th June 2017 the Committee has further scrutinized the nomination documents submitted by Kasule Mujib and found that the said aspiring candidate did not comply with the mandatory requirements stipulated in the FUFA Statutes, FUFA Electoral Code and FUFA Electoral Guidelines for candidature of the FUFA President and FUFA Executive Committee. Article 10 (6) Subject to the fulfillment of the eligibility prerequisites, a candidate to the office of the FUFA President shall only be valid if supported by any three members of FUFA where one such member is from the FUFA Super League Clubs or FUFA Big League, the other member being from Special interest groups as defined in article 10 (1) (d-1) of the FUFA Statutes and the other member being a Regional Football Association. In addition, Mr Mujib Kasule did not also comply with Article 39 (4) of the FUFA Statutes –Only Members of FUFA may propose candidates for the office of President. Members shall notify the general secretariat in writing of the name of a candidate for the presidency of FUFA at least two months before the date General Assembly. Finally, Article 11 (2) of the FUFA Electoral Code 2012 states Candidatures will be registered by the EC, scrutinised by the EC for compliance with this code, the FIFA, CAF, FUFA and/or respective statutes of the organization for whom elections are being conducted and declared eligible for election after payment of the respective fees as stipulated in this code. Based on the above reasons the Committee unanimously found that Mr. Mujib Kasule failed to fulfill the mandatory requirements and is therefore ineligible for nomination as a candidate for FUFA President.